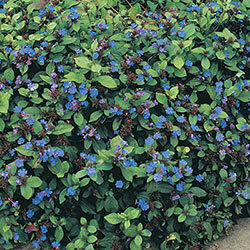 Blue on a ground cover, it's the gardener's dream because it washes the area in an eye-catching sea of cool tones. 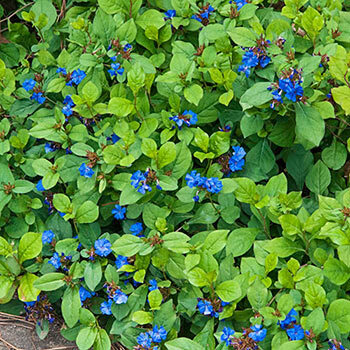 Plumbago is an excellent choice for this, not only do you get the late summer to fall, bright blue blooms, but once that's through in fall, the foliage turns a fiery bronze-red. It's hardy and reliable. 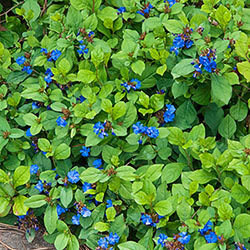 As a ground cover it forms a dense mat that suppresses weeds—the gorgeous alternative to mulching garden beds around your larger shrubs or perennials. Plumbago's also fabulous in rock gardens and mixed containers. Feeds butterflies at a time when not much else is in bloom for them to snack on. Foliage Type: Oval, shiny, medium green leaves that turn bronze-red in fall. Flower Form: 5-petaled blue flowers that resemble woodland phlox. Additional Information: Plant spreads by rhizomes and can be somewhat aggressive.